There are many ways Edmentum partners with schools and districts throughout the state of Ohio, whether it is helping support the improvement of end-of-course (EOC) scores, providing credit recovery, or identifying a way to provide a personalized learning path for students. Edmentum is committed to solving everyday challenges with you. For Dr. Scott Ebbrecht, the director of alternative education and assessment of Westerville City Schools, that meant identifying a solution to help support his students who needed to retake their EOC exams. I was happy to jump in and help. Given that alternative graduation pathways were no longer an option going into the 2018–19 school year, Dr. Ebbrecht and his team at Westerville City Schools knew that they needed to provide a remediation option for students during the fall semester for the 2019 graduation cohort who had not yet achieved the required points on the EOC exams. Similarly, we knew that educators across Ohio were facing this challenge, which is why we chose to partner and share effective best practices for EOC preparation at a recent lunch-and-learn event. During the event, Dr. Ebbrecht and Corinne Hayes, assistant superintendent of Southwest Local Schools, were able to share two approaches to help support EOC exam improvement for their students that centered around both preparation and remediation. Let’s take a look at how similar approaches resulted in both growth and proficiency for their students. For Westerville City Schools, a combination of Edmentum’s Test Packs for Ohio for EOC intervention was the perfect fit, providing both the automatic learning paths and instructional content prescriptions for students who failed to demonstrate proficiency on Ohio's EOC assessment. Here’s how it works: A preassessment is administered (for example in biology), with lessons then generated and prescribed to students based on the identified skills in need of remediation. Students work through the assigned, adaptive lessons at their own pace, with questions mirroring what they will find and experience on Ohio’s EOC assessments. For Southwest Local Schools, Corinne Hayes shared that the intervention “sweet spot” is a combination of Study Island and Edmentum’s Test Packs for Ohio. The utilization of both products provides alternate explanations that really helped support a wide variety of learners with the combination of the assessments and the extensive practice question bank. During the lunch-and-learn, Corinne Hayes was also able to share the exciting results at one local school, William Henry Harrison High School, where 50% of students went up a point in their test scores, 27% of students in EOC intervention scored proficient on EOCs, and 50% of students achieved growth. 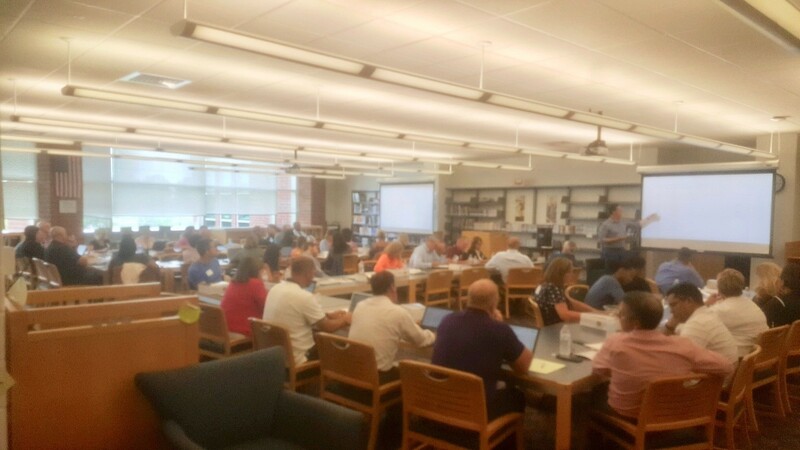 While each school’s programs looked slightly different, we were excited to share the details of effective remediation planning and support with over 50 educators in attendance across 17 districts, including Gahanna-Jefferson Public Schools, Delaware City Schools, Tri-Valley Local Schools, Big Walnut Local Schools, Jonathan Alder Local Schools, Dublin City Schools, Teays Valley Local Schools, Groveport Madison Schools, Bexley City Schools, New Albany-Plain Local Schools, Lancaster City Schools, Pickerington Schools, Logan-Hocking Schools, Zanesville City Schools, and Marion City Schools. We’re looking forward to sharing more about how we can partner with Cincinnati districts at our next lunch-and-learn event! Interested in learning more about how we can support your students’ success on EOC programs? Read more here or watch this short video to get a deeper dive of how we can support Ohio educators this school year. Mike Satterfield is the Partnership Development Manager at Edmentum for Central & Southern Ohio and has been with the company since 2013. Mike received his Bachelor of Science degree in Elementary Education from The Ohio State University. Mike enjoys working with educators to help them determine the solutions they need, so to make a difference in the life of each child and empower them to succeed.